Despite a bout of illness last week, from which I am now nearly recovered, I managed to dine out for a couple meals in the last week. First up, a random craving for Jamaican Jerk Pit. To start, we were considering either the Fried Plantains or else the Jerk Chicken Nachos, so instead, we compromised and ordered the Plantain Boat with Chicken, “Hand pressed plantain, topped with diced Jerk chicken, peppers, onions and cheese.” It was okay, but I think I learned that I like my fried plantains sweet, and my nachos salty, and this dish was the opposite – savory plantains, that weren’t very sweet, and that wanted to be nachos, but weren’t salty enough to pull it off. I just don’t know. 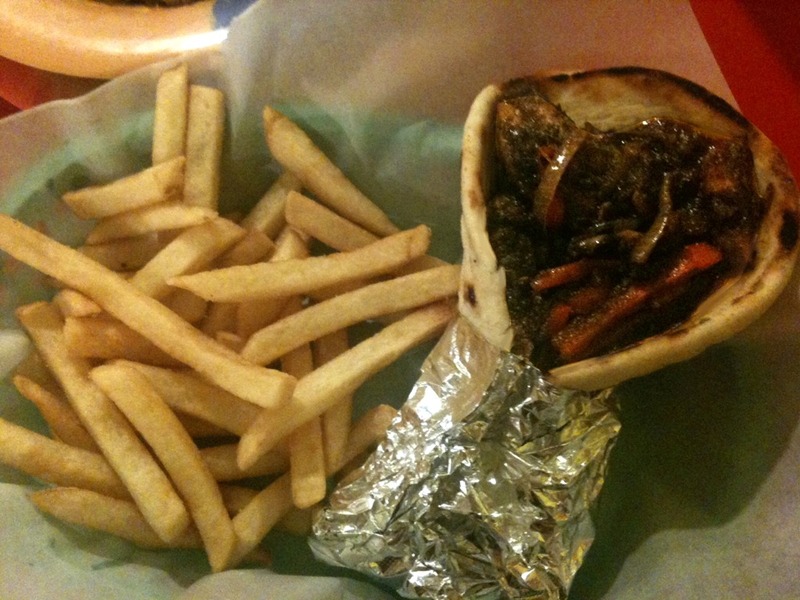 It had been nearly a year since my first and only visit to Jamaican Jerk Pit, however, I had been thinking of the Jerk Chicken Pita ever since! It left quite an impression on me. Clearly, I had to order it again, and my WORD, was it delicious. So much better than our starter dish. The pita was very thick, soft, warm, and pillowy, and packed full of super-flavorful and moist Jerk Chicken. 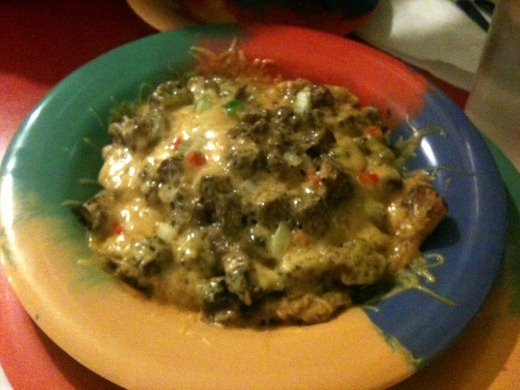 It has a perfect level of heat for me (well I take it back… I wouldn’t mind it just a touch hotter), packed full of grilled peppers and onions, and was just dripping with deliciousness. Pretty awesome. Got my Iorio’s fix this week. Thank goodness. I was having severe withdrawals after going 15 days without any gelato. Nothing too crazy in this dish, just a few classics. 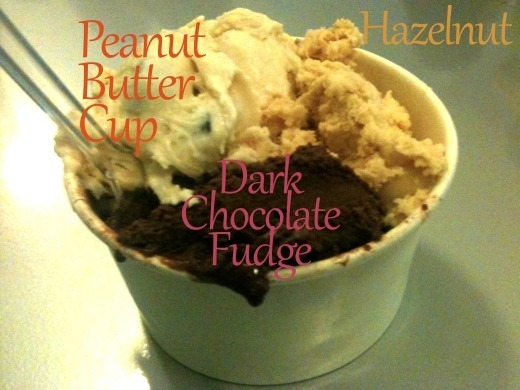 Hazelnut was my favorite. Naturally, as you might expect, we also got our Sidetrack fix last week. 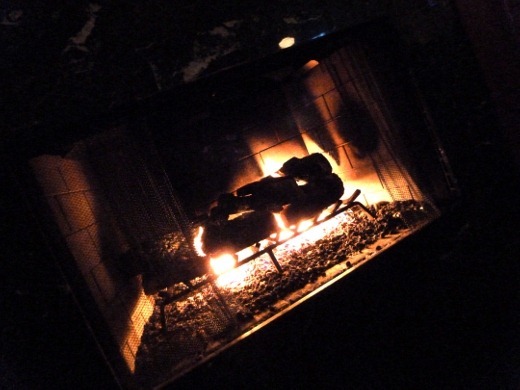 For the very first time, I was seated next to the fireplace, on the Frenchie’s side. LOVE. Tried something new to me, of course! 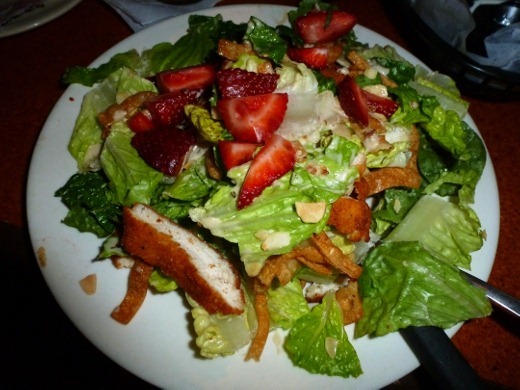 This is the Crispy Chicken Strawberry Salad. The salad dressing was incredible, a definite food-swoon. Apparently it is “Zesty Spring Dressing.” What is that? What does it mean?! Can I have the recipe… please? The chicken was good, but didn’t knock my socks off. But still, loved this salad, and ate the whole dang huge thing. Huz got a burger, but not the BBQ Slaw. 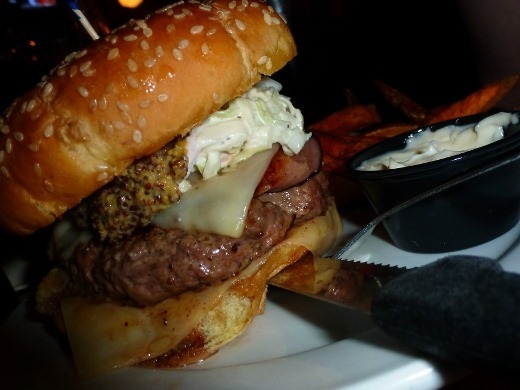 Instead, he ordered the featured burger of the day, the Hamtrak (play on words.. Ham + Amtrak… since the Amtrak train tracks run by the restaurant – har har har), which had a beef burger, ham, Swiss, grainy mustard, and coleslaw, with Sweet Potato fries and mayo dipping sauce. Looks good! Currently listening to: Fade Into You – Mazzy Star. I’m a fan of jerk chicken. I’m a fan of anything really spicy. I haven’t found a really good caribbean place to eat in Windsor yet, but I heard a new one just opened so I’ll have to give it a shot.